Post-Sandy: Atlantic City Wants Its Tourists Back A month after Hurricane Sandy pounded the New Jersey Shore, Atlantic City is back in business. Even though most of the casinos, restaurants and the famous boardwalk sustained very little damage in the storm, they're now suffering from a lack of visitors. 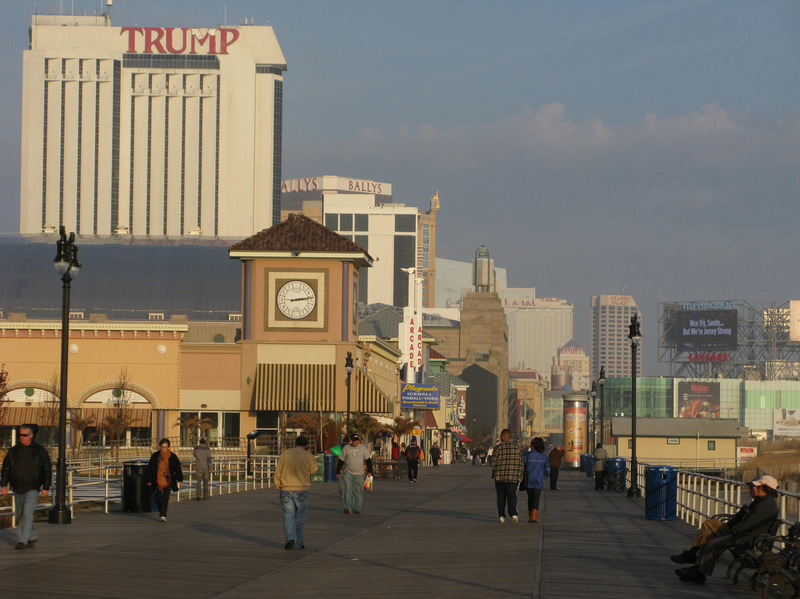 Atlantic City's boardwalk, with its shops, restaurants, casinos and hotels, was mostly protected during Hurricane Sandy by a dune restoration project. But TV images of one small section that was damaged gave the impression that the whole thing was destroyed. A month after Hurricane Sandy pounded the New Jersey Shore, Atlantic City is back in business. Even though most of the casinos and restaurants sustained very little damage in the storm, they're now suffering from a lack of visitors. But the city has launched an effort to change that. As three young boys roll their skateboards down the "World Famous Atlantic City Boardwalk," it's proof that it is still here, fully in tact, and that rumors of its demise were greatly exaggerated. 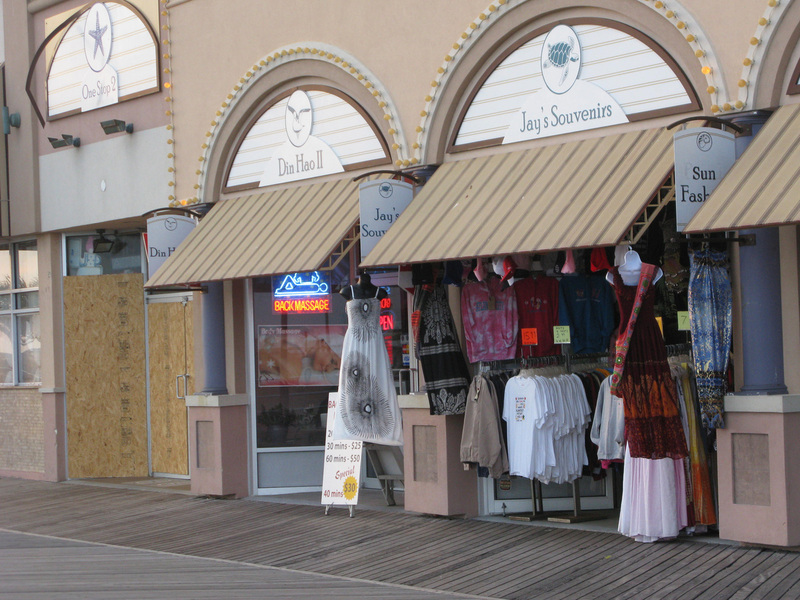 Rumors of the demise of Atlantic City's boardwalk were greatly exaggerated — only a small part was damaged. Now city and tourism officials are trying to draw people back. "Conditions down here are a lot better than I thought they would be," says Ed Cody, a visitor from Philadelphia, who along with his fiancee, Cheryl Lyons, was making a midweek getaway. "What I heard during the storm over there was just like the boardwalk was all torn up and there was sand in the street," Cody says. "The pictures on the TV made it look worse," Lyons adds. Sandy's high winds and floodwaters did devastate scores of homes and businesses in Atlantic City, especially around the Back Bay areas, but along the oceanfront, a dune restoration project protected most of the boardwalk and the shops, restaurants, casinos and hotels on it. Sandy did damage one small section of the boardwalk, but city and tourism officials complain that TV news showed those images over and over again — giving viewers the impression that the entire boardwalk was destroyed. So, they're fighting back with a new TV ad, which is airing in New York, Philadelphia, Baltimore and Washington, D.C. 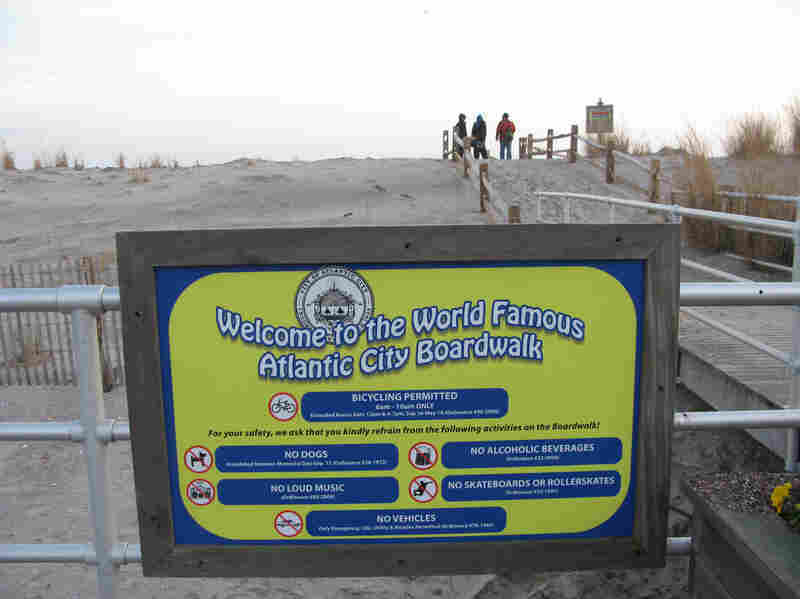 It shows people biking and jogging on the boardwalk, along with scenes of Atlantic City's night life. At Atlantic City's Tropicana Casino resort, business has been slow since Hurricane Sandy, but it's starting to pick up again. "I think the message here is that ... we're open for business. We're in great shape physically and, quite honestly, we need your help," says Liza Cartmell, president of the Atlantic City Alliance, which is sponsoring the ad. The alliance was created a year ago as a marketing arm of the casino industry. Competition from new casinos in nearby states had already begun to cut into business, and a severe slowdown since Sandy has led to layoffs and reduced hours for many workers. So Cartmell says Atlantic City urgently needs an economic boost. 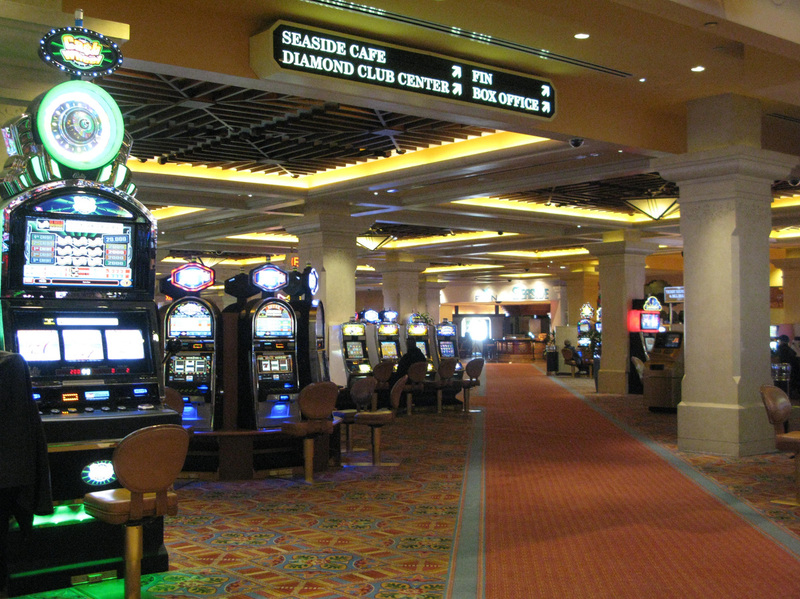 "We have 40,000 people whose livelihoods depend on these casinos. They are the ones who were impacted at home, where their homes may have been flooded. They need their jobs and income in order to rebuild," Cartmell says. Inside the Tropicana Casino, there's actually a fair number of people for a midweek December afternoon, playing slot machines, blackjack and other games. Tropicana President and CEO Tony Rodio says business is picking up after a very slow November, but he worries about Sandy's long-term impact on his customer base up and down the Atlantic Coast. "There's people whose lives have been impacted by this, and it's not going to take weeks or months, it's going to take years for people who have homes that were totally destroyed, or second homes or businesses, and there's a ripple effect to that," Rodio says. At Jay's Souvenirs on the boardwalk, Yaqob Abro says it costs him more to commute to work and keep the lights on than he's making in sales most days. And that ripple doesn't just go through the big casinos, but inside the small, kitschy shops along the boardwalk, as well. Yaqob Abro greets a lone shopper who walks into his souvenir shop, and she has her eye on a certain purse. "How much is it?" she asks. "This is $15, but you are my first customer all day. I'll take $13," Abro answers. "I can't do it," the woman replies, "but thank you." And so it goes at Jay's Souvenir Shop, where Abro says he's hardly selling anything. "Today, like, I open at 11 o'clock, now it's almost 4 o'clock, I got only one customer, $15. And last night, I was here until 5 o'clock, I make only $25," he says. Abro says it costs him more to commute and keep the lights on than he's making in sales most days. He says if this slow pace continues, he might not be able to make it to the more profitable months of spring and summer.